Not long ago, my daughter told me that she was making me a raw chocolate smoothie and I literally cringed! I guess I had no idea how delicious it is. I told her not to bother because she just needed to rest. I knew she was extremely tired from working all night and needed to go to bed. 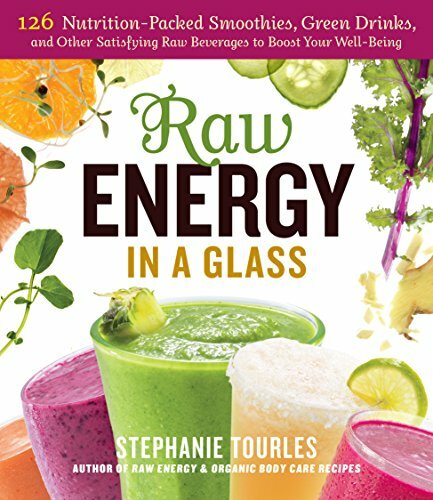 Raw Energy in a Glass: 126 Nutrition-Packed Smoothies, Green Drinks, and Other Satisfying Raw Beverages to Boost Your Well-Being And while I meant what I said, the main reason I told her that was because the smoothie sounded terrible. RAW?? And an AVOCADO in a chocolate smoothie sounded gross. She made it and I loved it! In fact, it was so awesome I could have drank another one, but didn’t mention it. When you see the word “raw” it can sound like it’s bad for you. But it is the opposite. You get all the natural vitamins and minerals: nothing is destroyed. It’s so great to eat or drink something that is actually good for you! Well, that’s what I have discovered with this raw chocolate smoothie. It is so chocolatey and creamy that it melts in your mouth. This recipe is very tasty just the the way it is, but you can also add some cinnamon to give it a different touch of wonder. In fact, you can add any flavor that sounds good to you. And who doesn’t like chocolate? The strong desire for chocolate begins in childhood. They beg for chocolate candy, chocolate ice cream, chocolate cake and chocolate milk shakes. There is no end to it. They even like it in sandwiches. And HERE we have this rich and delicious drink that is full of nutritious ingredients. And no preservatives. When you eat or drink anything that is “raw,” you can know that your body loves you. Well, this is one thing that rings true. But plan on developing an addiction: an addiction to raw smoothies. Easy, delicious and healthy, this raw chocolate smoothie is the perfect breakfast or snack for a busy person. Here are a fee more recipes that will hit the spot when you crave some chocolate dessert.